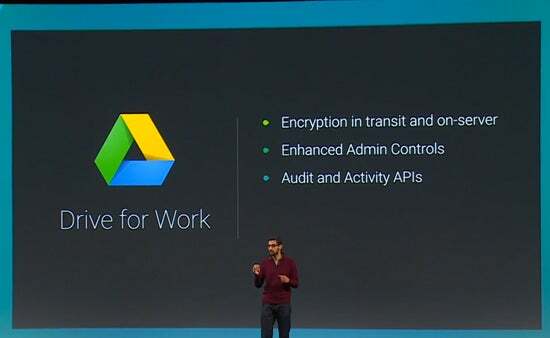 Google announced two new enterprise initiatives at its 2014 I/O developer conference: Android Work and Google Drive for Work. CIO.com's Al Sacco details the new IT security features in Android and breaks down the cloud-storage enhancements for business. Yesterday's marathon Google I/O developer conference keynote, which lasted nearly two and a half hours, surprisingly dedicated a significant chunk of time -- by Google standards, at least -- to new enterprise features and enhancements in Android and other Google products. It was a notable departure from past I/O conferences, when Google mostly glanced over any enterprise-related news. If you have more than two hours to burn, you can watch the full keynote. If you're only interested in the most relevant enterprise news from Google I/O 2014, read on. Google's single most notable enterprise-related announcement from I/O 2014 is Android Work, a component of its upcoming mobile OS that brings a new set of native mobile device management (MDM) features and IT controls to Android. For the next version of Android, Google has integrated key security features from Samsung's KNOX offering into native Android. This means many of the security features built into Samsung's fleet of Android devices will be available in all future Android smartphones and tablets. Android Work features include a new Device Policy Client (DPC) that lets IT create multiple profiles on a single device; this separates sensitive corporate data from personal data. The feature is common today -- BlackBerry built it directly into its mobile OS in the form of the BlackBerry Balance service, which was first announced in 2011, and Samsung's KNOX lets IT create separate "personas" for work and personal on Samsung Android device -- but Android Work brings the functionality to all Android devices. Android Work gives IT new controls for app distribution within Google Play. For example, businesses can use Google Play to bulk distribute apps to everyone in a company, a specific group of users or to individuals. Google Play will also offer bulk purchasing and licensing options for enterprises. Apps sent to the work profile have an Android Work suitcase logo, so users can easily tell which apps are work apps. Once applications are deployed, IT can use a security policy to manually adjust in-app settings to remove or restrict certain functionality. As part of Android Work, Google is also opening up new Android APIs that are designed to let enterprise mobility management (EMM) vendors integrate their products with the latest version of Android and build new Android-specific security features. Google says the first devices that support Android Work will be available later this year. Google also announced significant new cloud-storage features for businesses and debuted the new Google Drive for Work service. Data stored in Drive is also now encrypted while in transit and on Google servers, according to the company. New e-discovery and auditing controls help address enterprise compliance concerns. Google says Drive now has a SSAE 16 / ISAE 3402 Type II, SOC 2-audit, ISO 27001 certification, adherence to the Safe Harbor Privacy Principles; it can also support industry-specific requirements such as HIPAA. And new admin features give IT more control over users' Drive storage accounts. Perhaps most notably, Google is now offering unlimited Drive storage for $10 a month, per user, with a massive individual file-upload limit of 5TB. All new Google Drive for Work features are available immediately. Read more about Google Drive for Work on the company's enterprise blog.